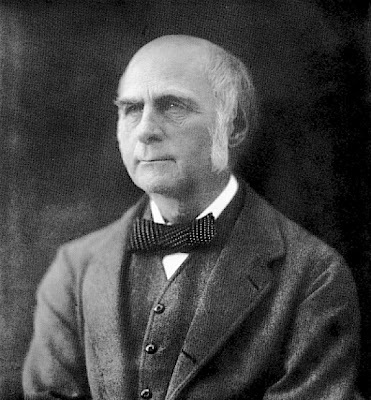 Yesterday's Person-of-Mystery was Sir Francis Galton, the man who first coined the term "nature versus nurture." 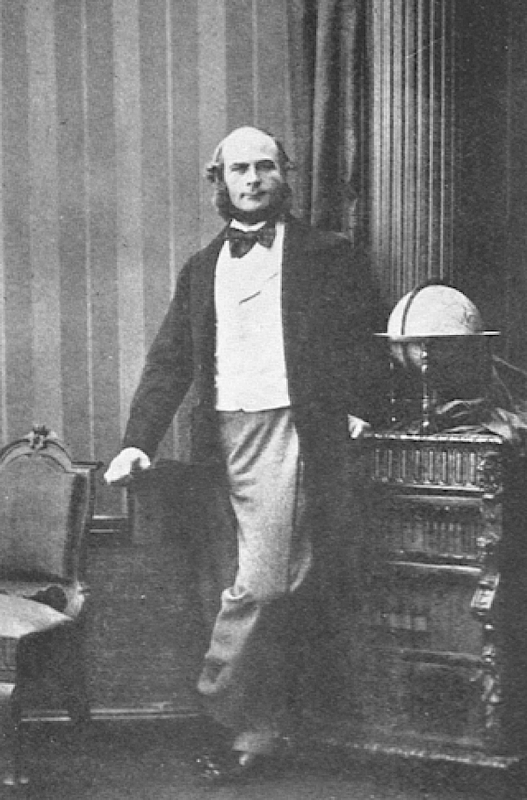 Francis Galton might best be described as a Renaissance Man. He had a penchant for observing, counting and measuring and over his life, made significant contributions to a number of disparate fields. Although while in college, Galton had prepared for a career in the medical profession, after leaving Cambridge, he traveled extensively first through Eastern Europe and then up the Nile to the Sudan. He then journeyed through the Middle East and in 1850 he embarked on a groundbreaking expedition through what is now Namibia in southwestern Africa. Through his travels, he developed an interest in geography, anthropology and meteorology (Galton would be the first to discover anticyclones and publish the first popular weather map based on charted data of air pressure). His penchant for data collection would lead him to introduce the concepts of regression, correlation, and standard deviation to statistical study. Unknown to me before reading more on Galton, Charles Darwin was a first cousin of his. After the publication of Origin of Species, Galton became increasingly interested variations of human populations and their behaviors. He studied the possibility of inherited ability or behaviors among humans and created the study of differential psychology. 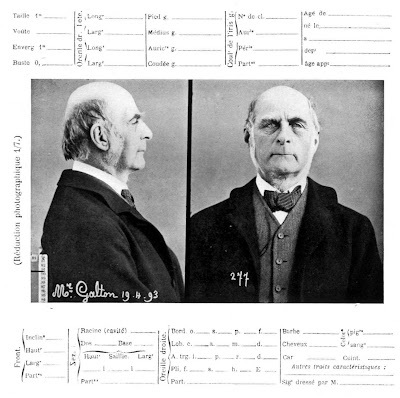 His studies dabbled in eugenics and inheritance of behaviors including criminal behavior – Galton also invented a system for classifying fingerprints. He was the first to pose the question of "nature versus nurture," and was one of the first to gather information on twin studies. It seems as though the "nature versus nurture" debate always seems to raise its head whenever some evil individual commits some horrid act. Anyone care to share their thoughts in this matter? I've learned that 1/3 is determined by nature, 1/3 by the parents and 1/3 by the neighborhood. So nurture will have a bigger impact if this is correct. Have a nice christmas time! I've always heard that nature deals the cards but environment plays them. Merry Christmas, Nate.